You need both mangoes and bananas for this quick and easy dessert. Blend together the sliced banana, a half cup of curd and sugar/jaggery syrup and keep aside. Blend together the sliced mango, a half cup of curd and sugar/jaggery syrup and keep aside. 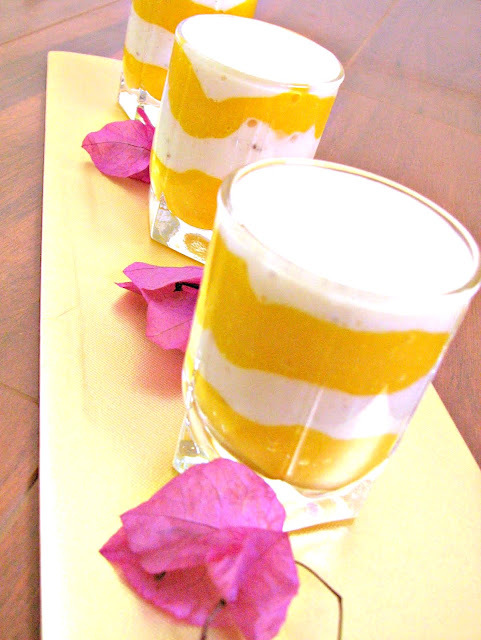 Take the serving glass and alternate spoonfuls of mango mixture and banana mixture. Note: For a Banana Mango smoothie, the amount of curd can be increased and everything blended together. Since the inspiration for this was the classic Kerala dessert (one which is made at the table itself), I'm sending this to Magpie's Recipes for the Kerala Kitchen of this month.